Stop right now! You stop your thoughts of "Ew...chocolate covered potato chips??!" I am here to tell you that no...they are NOT gross. They are absolutely delicious (when done right). Let me tell you a little tale. There have been a couple occasions are chocolate covered potato chips were presented to me. They were chips that were very thickly covered in a hunk of milk chocolate. And they were...meh. But I knew they had a greater potential. I knew they just weren't being executed correctly. I LOVE sweet + salty...and that's all this potato chip business is. 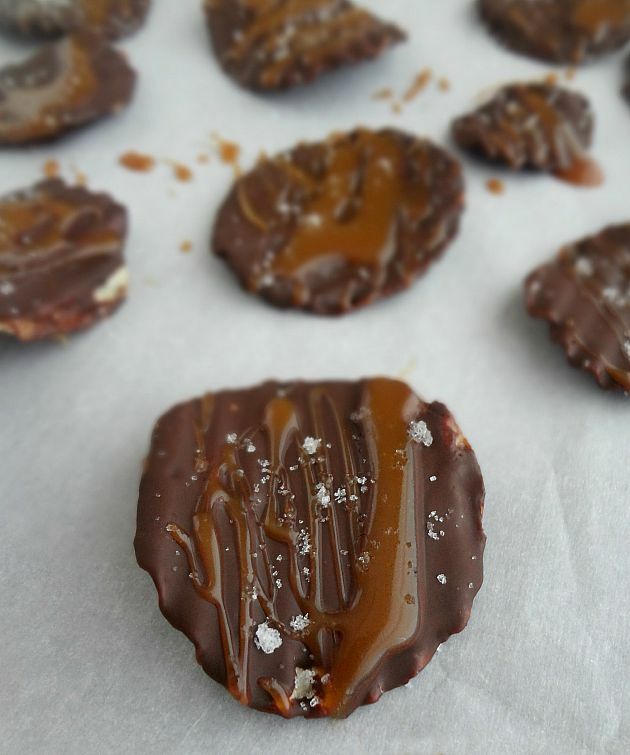 So I knew that I would make my own chocolate covered potato chips...but I would use a thin layer of DARK chocolate (it gives a much nicer contrast and just tastes better) and add a salted caramel drizzle and sea salt...because...I mean...that just sounded great. I waited for the wedding to be over so I could make something sinful and decadent. I waited to make salted caramel sauce. And that day finally came last week. And so I made them. And they were GOOD. Honestly...you barely taste the potato chip. 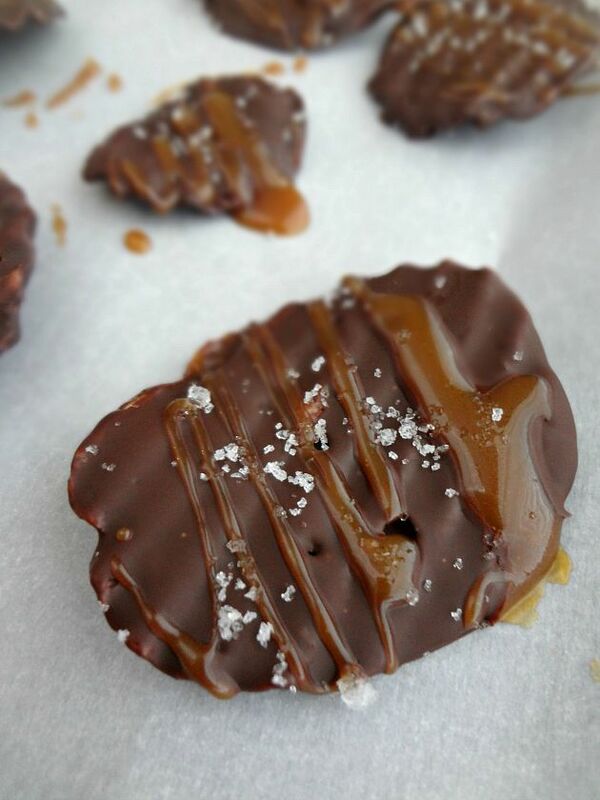 It's just a little crunchy salty something underneath the rich dark chocolate and heavenly salted caramel. It may sound weird but...try them. You won't regret it. You'll just thank me as you shovel chip after chip into your face. Or fight with your husband over whether or not you or they should eat anymore because WHAT IF YOU EAT THEM ALL AND THEN THEY'RE GONE??! Line a baking sheet or large plate with parchment or wax paper. Melt desired amount of chocolate chips on high for 30 seconds at a time, stirring between each increment, until melted in smooth. 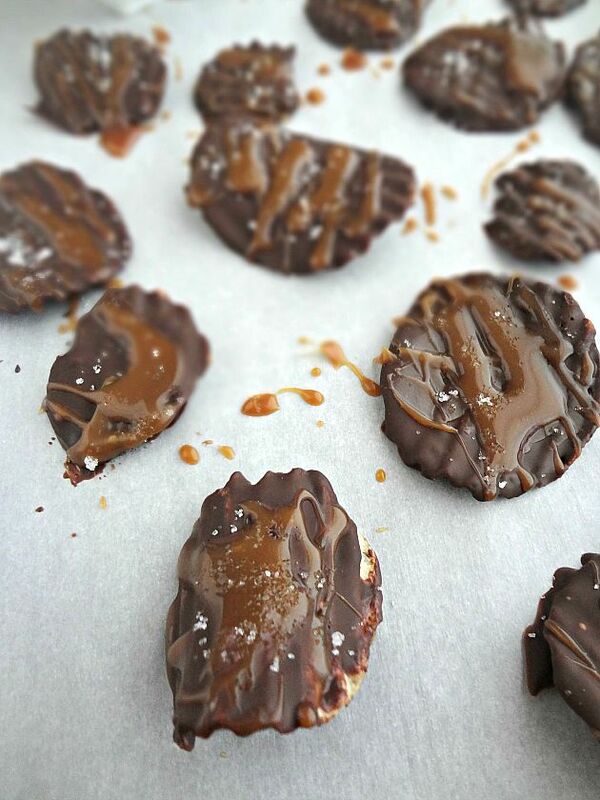 Dip the potato chips in the chocolate and just thinly coat. Place on parchment or wax paper. Refrigerate for 10 minutes-long enough for the chocolate to set. Heat up caramel sauce until just loose enough to drizzle. 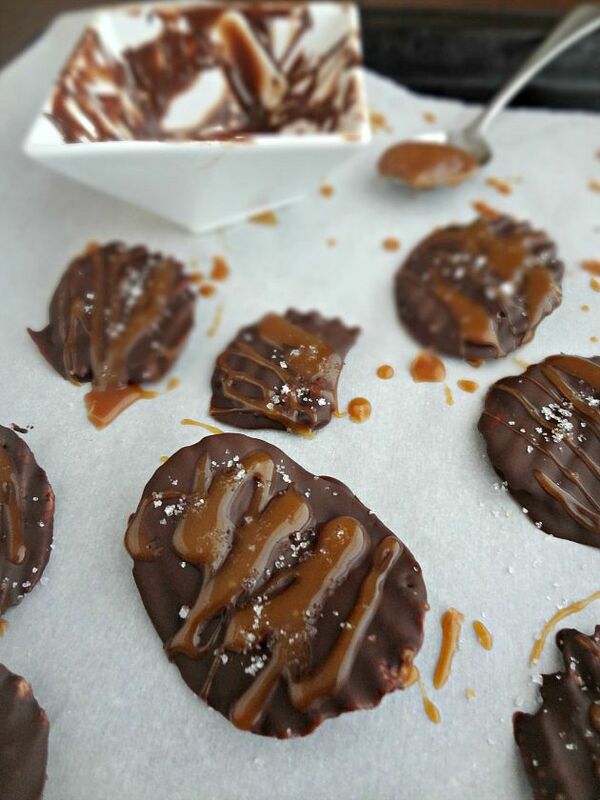 Using a fork, drizzle the chocolate covered potato chips with the caramel and then sprinkle with sea salt. Refrigerate for at least 15 more minutes, until fully set. Store leftovers in an airtight container in the refrigerator (be warned the chocolate will get messy if left out at room temp. for too long).